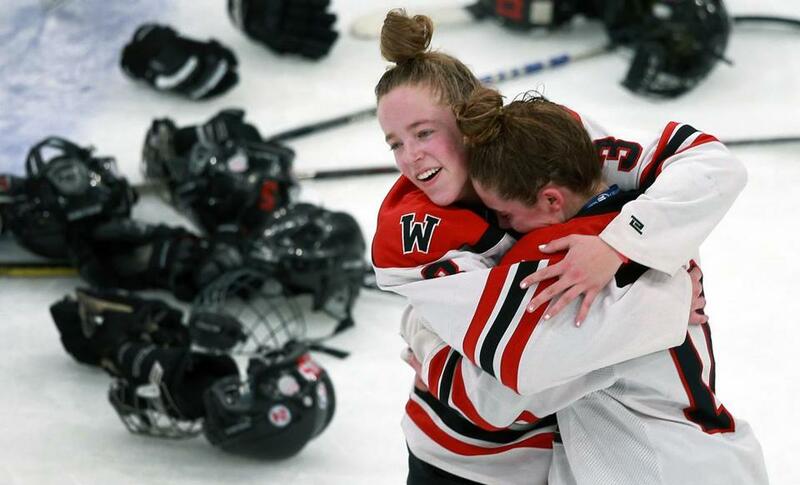 Wellesley’s Emily Rourke, left, hugs teammate Bliss Vernon after Rourke scored the winning goal in overtime of the Division 2 girls state hockey final against Notre Dame Academy-Hingham. Emily and Lulu Rourke grew up playing street hockey in the driveway at their Wellesley home. The sisters, two years apart, never played played together on the ice, always separated by one division in youth hockey. This season, skating for the Wellesley girls’ varsity, the Rourkes paced the Raiders in scoring. 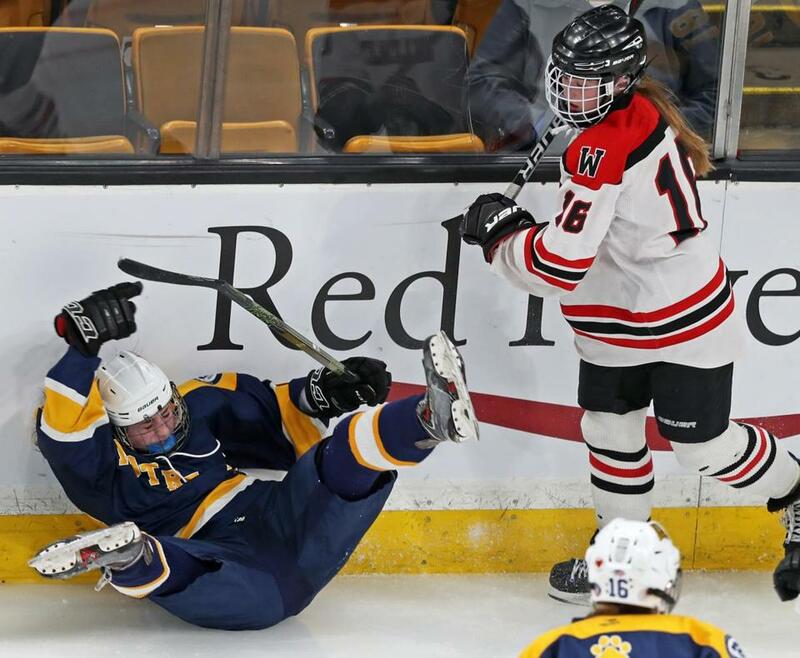 In Sunday morning’s Division 2 state final, junior Emily Rourke scored the winner through a double screen with 19.2 seconds left in overtime, with the assist to her freshman sister, Lulu, lifting Wellesley to a thrilling 3-2 victory over Notre Dame Academy-Hingham at TD Garden ad Sundayturdayendad for the program’s second straight Division 2 title. Emily, 17, received a pass across the neutral zone from 15-year-old Lulu and slipped it past Notre Dame goalie Lily Prendergast, an eighth grader who was spectacular with 44 saves. “This is overtime in the state championship, there’s no bad shots,” said Emily Rourke. “I get the puck over the blue line and I’m just thinking make a move and take a quick shot. I see it go in over the goalie’s pad and it was the best feeling in the world.” Lulu recorded two assists, put 11 shots on goal and played for more than half of the 12-minute extra frame. Wellesley (17-4-3) dominated, outshooting the seventh-seeded Cougars 47-14 , including 18 in an eventful second period. But after 30 minutes of play, the score was tied, 2-2, thanks to a pair of fortunate bounces for the Cougars (16-6-2). Late in the first period, a shot from NDA senior Natalie O’Brien ramped off a Wellesley defender’s stick and past goalie Liddy Schultz. The Cougars’ second goal came in similar fashion when senior Caitlin Delano fired a shot off the leg of a Raider defender that bounced right to classmate Kelly Morrissey for the easy finish. Wellesley took its first lead midway through the second period on two goals in a minute and 38 seconds. Notre Dame Academy's Kelsey Stewart, left, hits the ice after colliding with Wellesley's Bliss Vernon along the boards in the third period. Senior Devin Chapman scored the equalizer, tucking home a loose puck in the crease. Shortly after, freshman Danielle Cimino put the Raiders ahead, roofing a shot from the right circle. In the final period and overtime, NDA stepped up defensively blocking seven shots and limiting quality chances in the middle of the ice. A late power play for Wellesley came up empty thanks to superb work from Prendergast. Throughout overtime, NDA continued to frustrate Wellesley keeping shots to the outside. Wellesley’s Grace Dore hoists the state championship trophy. 1, ND, Natalie O'Brien (Alexa Graziano) 14:16. 2, W, Devin Chapman (Erin Fleming) 3:28. 3, W, Danielle Cimino (Mackenzie O'Neil, Lulu Rourke) 5:06. 4, ND, Kelly Morrissey (Caitlin Delano, Dani Longuemare) 11:14. 5, W, Emily Rourke (Lulu Rourke) 11:40. Saves: ND, Lily Prendergast, 44; W, Liddy Schultz, 12. Dan Shulman can be reached at dan.shulman@globe.com. Jenna Ciccotelli can be reached at jenna.ciccotelli@globe.com.